The Liberal Bee Jay embarked on a six game road trip Tuesday. 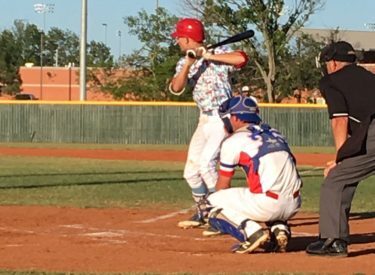 The started on the right foot with a 7-4 win in Edmond against the Oklahoma City Indians at Oklahoma Christian University. It’s Liberal’s eighth consecutive win. Expected starter Cole Jenkins was scratched from his start due to tightness in his shoulder so sidearming Tyler Tognarine made an emergency start. He gave the BJ’s three innings. Zach Autin made his second appearance and tossed six strong innings allowing just one hit. Derek Craft finished things off with a scoreless ninth for the save. The Bee Jays loaded the bases with no outs in the first but scored only one run as a double play stymied Liberal’s attack. The boys in blue loaded the bases again in the third, this time with two outs and scored one. Colton Onstott singled home a run with two outs. The Indians struck Tognarine for three runs on three hits in the third for a 3-2 lead. The last place Indians gave the lead right back walking two, balking, and tossing two wild pitches allowing the tying and lead runs to score. Liberal added two more in the sixth when James Hardberger lined an RBI single up the middle and Zac Cook tripled to right. The Indians scored a run in the eighth to make it 6-4 but Cale O’Donnell lofted his first homer of the summer over the left field wall for a 7-4 lead in the ninth. First place Liberal is 11-3 and OKC is 3-11. The same two teams meet Wednesday night at 7 with the Dugout Show at 6:45 on 1270 and kscbnews.net.